The beauty of improved technology is that nowadays creativity is at our fingertips. Whether you are an app developer or an amateur filmmaker, there is a wide array of software and resources available for you to express your creativity. However, for the small film producer, no tool may be more valuable than the small film budget template created for you to use. Producing a small film is not as onerous as a Hollywood blockbuster, but it isn’t without its costs. Quantifying those costs and carefully tracking them makes the difference between a money-making endeavor and running out of funds to finish the project. By using the small film budget tracker filmmakers can easily account for the cost of labor, equipment rentals, talent and other miscellaneous and view it all at a glance. 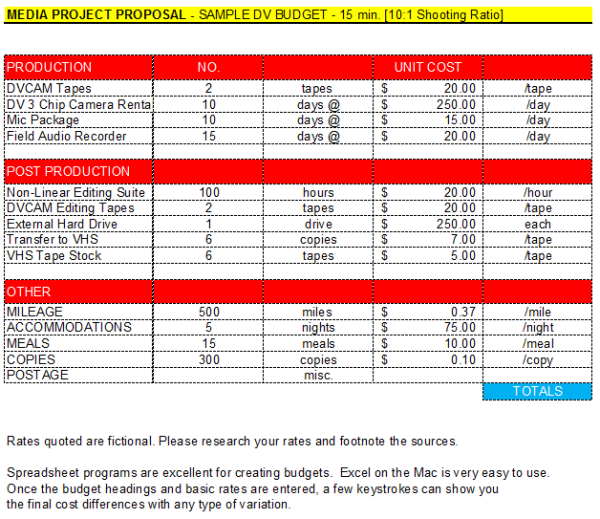 This template is especially flexible in helping create different scenarios for the film’s budget to prove feasible. By dividing expenses by category (production, post-production and others) one can virtually map out the filming process and articulate it in monetary value. Should it become necessary to update any figure or to include additional budget items, the template allows for flexibility while maintaining its at-a-glance capabilities. The small film tracker template has been created in in excel and is easy to use for all skill levels. It is ideal to be used as the starting point of any filming project and, when set up correctly, becomes the guideline to all expenditures related to the film. At the end of the project it will be very easy to see how the film performed and how projected expenses translated into real life. This template is an essential tool to all who embark upon a cinematic adventure.